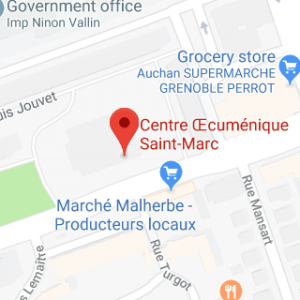 Our services are held at the Centre Oecumenique St Marc, 6 Avenue Malherbe, 38100 Grenoble, France. We meet in the Espace Cana. The C5 bus runs along this road from the University campus to Palais de Justice. (bus stop Louis Jouvet). The tram line A has a stop at Malherbe at the western end of the road. The C4 bus runs along Avenue Jean Perrot, at the eastern end of the road (bus stop Teisseire), near the “Simply” supermarket. There is plenty of car parking behind the supermarket and opposite the Church Centre. Church’s location. Click here for a map of Grenoble showing the Church’s location.